The Quad Gear UTV Roll Cage Top mounts directly and securely to your UTV's roll cage. Cinch-tight straps and tension panel straps make sure it doesn't come off or slide down leaving unsightly gaps. To further enclose your UTV, additional adhesive-backed grip-strips are included. A roll cage top is only as good as the material it's made of. This Roll Cage Top is constructed of heavy-duty ProtekX6TM fabric. The ProteckX6 has water-resistant backing and exterior coating for maximum weather and abrasion resistance. That means it'll be good for many years to come. 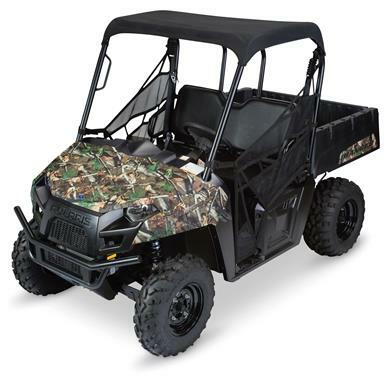 Quad Gear UTV Roll Cage Top, Polaris Ranger 900 XP is rated 4.5 out of 5 by 4. Rated 4 out of 5 by Franco from Very nice top for a great price! Well made top, would have given it 5 stars had it come with the hook stick on strip to match the front edge sewn on loop strip that could be attached to the windshield. I will have to go out and find a suitable length of that to finish the mounting. Maybe mine was just missing that piece as all the others were there. Rated 5 out of 5 by Billy from Great fit and quality! Excellent fit on my 2016 Polaris Ranger XP900 EPS. Overall, the fit and quality of the 'rag' top exceeded my expectations. Great value. Up and out of the way cargo room. Topnotch protection from rain and sun. Quick and easy installation, all-weather protection!